Using a bent wire hanger: this is an effective drain cleaning method, whereby you get a coat hanger and make it straight. Bend one end to look like a hook. 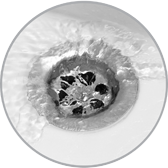 Push it into the drain and keep turning it to remove all hairs, and other stuffs that are causing the blockage. Finish by pouring hot water to completely unblock. By use of vinegar and baking soda: mix 1/3 cup of vinegar with 1/3 cup of baking soda. Immediately, pour it into the blocked drain and let the fizzing eliminate the hair, gunk and grime clogging the drain. Leave it for 12 hours then pour hot water. Use a wet and dry vacuum: dry up the liquid using the vacuum, followed by sealing the vent and creating a tight seal over the drain. Turn on the vacuum to the maximum setting for it to draw the clogging stuff up the pipe and to the vacuum bag. Boiling water: boil a lot of water and pour it onto the clogged drain slowly at intervals. Leave the water to seep inside and repeat the process till it is unclogged. Using caustic soda: in a gallon of water filled to ¾, pour into it three cups of caustic soda and mix it well. Pour it into the clogged drain and wait for a half an hour, followed by flushing it with boiled water to remove any remaining clog. Pipe cleaning: you will have to locate an empty bucket below the u-shaped pipe located below the sink, so as to gather all the water pouring. By the help of a wrench, untighten the pipe nuts to free the trap. Remove it and pour the clogs in the bucket. Using a toothbrush, brush out the gunk and wash it out using water, then replacing back the trap and tightening the nuts back in place. If you need help with you Drain Cleaning in Gilbert, AZ, call us today.